Harvard researcher David Edwards normally works on medical inhalers, designing them to deliver medicine in breathable, particle form. However, one day while looking to cut loose with his fellow researchers, he had a great idea. Why not make other stuff breathable, too? 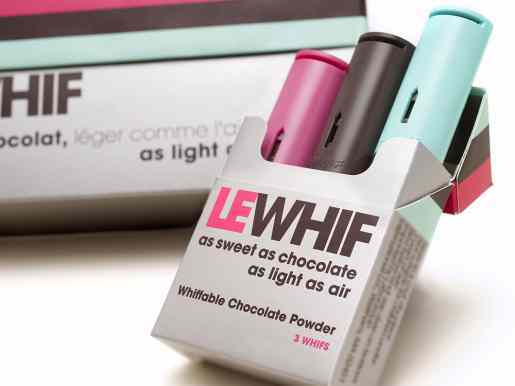 The result is Le Whif, an inhaled chocolate treat that has become a huge hit in Paris and will soon be making its way to the US. Basically, it’s particles of chocolate air that you huff from a tube. Basically, Le Whif is a lipstick-sized tube full of flavor. Says Edwards of his creation, “You open it up, put it in your mouth, and you breathe in. And you get a nice flavor. You can close it when you’re done, and then later on you can open it up again and you can “Whif” again. There’s about eight or 10 puffs per Whif.” With each tube costs $8 or so, Le Whif works out to be less than $1 per hit, so it’s not outrageously expensive, assuming you want to inhale cocoa particles. It reminds me of the movie Spaceballs. In that flick, there’s an air shortage, so the planet Druidia has the market on fresh air cornered. People like President Scroob crack open six packs of air and inhale it for a vacation in a can. It’s kind of like this, except instead of being in a can and being piney-fresh, this is more like a deep breath of Hershey, Pennsylvania. For maximum effect, pair it with a never-ending chocolate bar mugen.